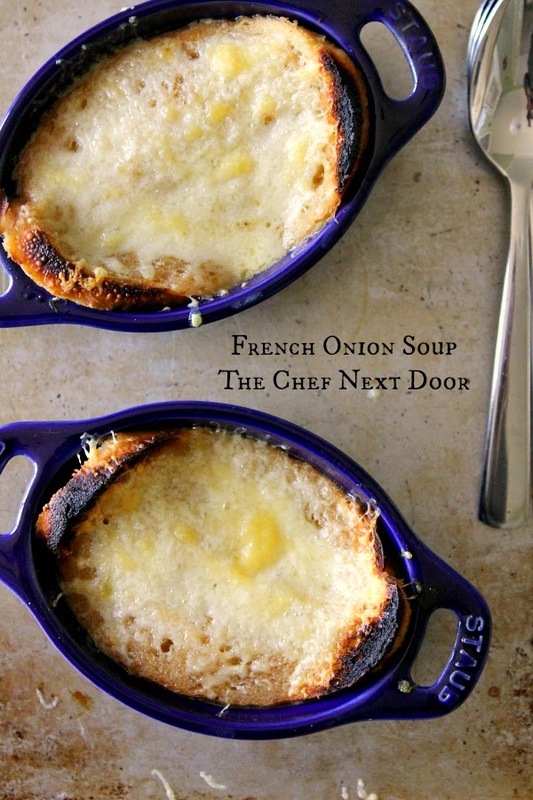 Rich and flavorful French onion soup topped with crusty bread and nutty Gruyere cheese is the ultimate comfort food! I've been in a soup mood lately. With the cooler weather, I just can't seem to get enough of it! I've been making a lot of homemade recipes, some that are classic oldies and others that are brand new. This French Onion Soup is one of those new ones. It's funny, I've never made it before at home, but it's probably one of my favorite soups! This soup is actually very easy to make, too. Not a lot of ingredients, not too involved, it just takes some time. And the results are magnificent. I'd dare to say that this soup is just as good, if not better, than those I've had in restaurants before. And it refrigerates well so if you have leftovers, it will taste great the next day, or the day after that. In a Dutch oven or large soup pot, melt the butter over medium heat. Add the onions and stir around to coat evenly with the butter. Cook the onions, uncovered, for 10 minutes, stirring occasionally. Reduce the heat to low and allow the onions to continue cooking for about 40 minutes longer, until they are a golden brown. Turn the heat to medium again and stir in the broth, water, pepper and thyme; heat to a boil. Reduce the heat, cover the pot, and let simmer for another 15 minutes. Turn the oven on to broil. Set four soup bowls onto a baking sheet. Ladle the soup into the bowls, top each with a slice of bread and sprinkle with cheese. Broil the soup for 2-3 minutes or until the cheese is melted and starting to brown. Watch carefully so the bread and cheese don't burn! Serve with additional bread on the side, if desired.